Magicians have been using the concept of the Entanglement Theory for centuries – a cause-effect demonstration that defies the norms of logic and science, – completely oblivious of the fact that it really exists. Most “Sympathy” effects are typical examples – when you and a spectator “coincidentally” turn over the same card in different decks, or 3 silks knot and un-knot in sympathy with 3 others, or a specific card reverses itself in a real deck as reaction to the imaginary action of a spectator reversing a thought-of card in an imaginary deck. This apparatus and effect is most appropriate as a demonstration of Entanglement – involving electricity, and by implication all the electrons and positrons and quarks, and whatever other sub-atomic particles you can pronounce correctly. The apparatus uses no hi-tech electronic circuits, no transistors or ICs, no magnets, reed switches, mercury switches, or hidden switches, no remote or radio controls – just a 9V cell, 4 bulbs (actually LEDs to give you much longer life), 4 switches and wires joining them. 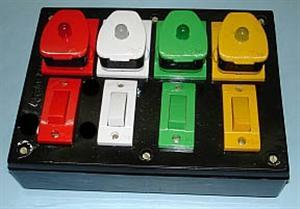 You get a “switch board” with four colored LEDs mounted on colored plugs that fit into matching colored sockets and four matching colored switches under them. You start with all the sockets plugged in the plugs of the same color, just above the identical colored switch. You now demonstrate that only the switch under the plug (of the same color) is the one that controls the LED of similar color. Switch on the red switch – the red LED lights. Switch it off, and it is switched off. None of the other three switches have any effect on this LED. Do it with all the other switches – each switch only controls only the LED directly above it. You could also light 2, or 3 or all 4 bulbs (LEDs) together, by pressing the appropriate switches. Let your spectators do this. Having demonstrated that the apparatus is nothing more than a board with four colored bulbs (LEDs), and four identical colored switches under them that control the LEDs, you give them the spiel about Entanglement, (detailed in the instructions that accompany the prop) and follow up with the mind blowing demonstration that defies all the popular concepts of physics, electricity, logic, and common sense. You interchange the LEDs (plugs) at random, as you or your spectator fancy (pull them out from their sockets, and plug them into another socket – say the red into the green, or exchange the plugs in two or three or all of the sockets). The switch of a particular color still controls the LED of the same color, and is the only one that does so, regardless of the socket it is plugged into. You will find there are endless possibilities and permutations and combinations – and you can have a spectator handle it all without going anywhere near the prop. For example have a spectator remove all the LEDs (plugs) from the sockets, select any one (say red), and plug it into any other socket. Only the switch of the same color (red) will control it – none of the others, including the switch under the socket have any effect. The spectator can interchange all the plugs, or some of them, and so on, with the same results.